” From the purity of lotus to the traditional portrayal of their enriched love”. Bride Asha was born in Kochi and grew up in Kolkata and Bangalore while Groom Michiel is of Netherland origin. They met in Rotterdam, Netherlands while pursuing their decorates. 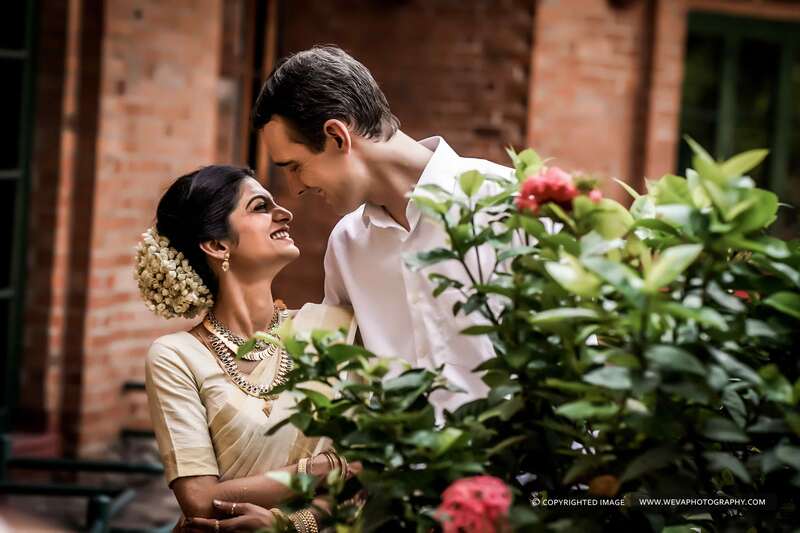 They currently reside in Heidelberg Germany.. – Destination Wedding Photography Kochi. On 26th April 2018- Sangeet Ceremony. As the name implies both of them sung and danced together. The event took place at The Spring Club Kolkata. Hence an excellent venue for organizing functions. In addition a quintessential place for a wonderful reunion like this. The Navy Blue – Pink combination of their costumes made their functions extravagent. On 27th April 2018 – Haldi and Mehendi – A pre wedding ritual of purity and heritage. As the colour yellow signifies happiness, hopes, freshness and positivity. The sunshine couple Asha and Michiel were also draped in yellow. The ceremony took place at Avidipta Banquet Hall Kolkata. Finally comes their Joyful Wedding Day and has took place at Tangerine Royale Banquets, Kolkata. Bride, Asha a typical Kolkata bride stunning in her classic Red Lehenga with amazing Nath, Jhumko, Tikli and Choker sets. Sayanta Dhali, bridal makeup artist in Kolkata had made her eye catcher on her wedding day. They wanted to create a unique Traditional Wedding experience hence they chose Sarovaram, Kochi Kerala as backdrop. Therefore they adopted Kerala Wedding Rituals and mould it as perfect as a Traditional Kerala Wedding.